If you are looking for the best solution for replacing missing teeth, please contact North Adelaide Dental Care today for a consultation with Dr.Kashefi to see if dental implants best meet your needs. 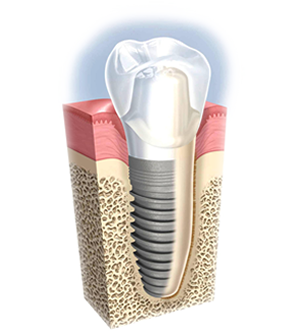 Dental implants are small titanium screws that are inserted directly into your jawbone to replace missing tooth roots. Once Dental implants bond to the jaw bone, they will provide the most secure hold for your artificial tooth. Once Dental implants are surgically inserted into your jawbone , a healing period is required in which your jawbone accepts your dental implant as a natural tooth root. Once accepted, you will return to our office to have an impression taken of the implant in order for a crown to be fabricated. Although it does take some time for dental implants to be completed, this wait is well worth the final results. At North Adelaide Dental Care , all parts of your implant procedure will be performed in our office by Dr. Kashefi, increasing both your comfort and convenience. Dental implants can be used to replace a single tooth, a few teeth, or an entire row of teeth. Dental implants can be used to provide a strong and functionally superior alternative to dentures. Depending on your individualized needs, Dr. Kashefi is able to use dental implants in variety of ways to provide the best possible results. Due to the superior hold offered by implants, Dr. Kashefi may recommend dental implants to hold dentures and bridges in place. When a dental implant is used to hold dentures or dental bridges, you can rest assured that your teeth will not slip out, fit uncomfortably, or cause harm to adjacent teeth.